Most people celebrate our national day for giving thanks with a feast that centers on the Turkey. Naturally, the turkeys have other ideas, and seek refuge on this holiday. Just as naturally, my friends and I seek Refuge to see turkeys and other birds, by spending our Thanksgiving weekend at National Wildlife Refuges. 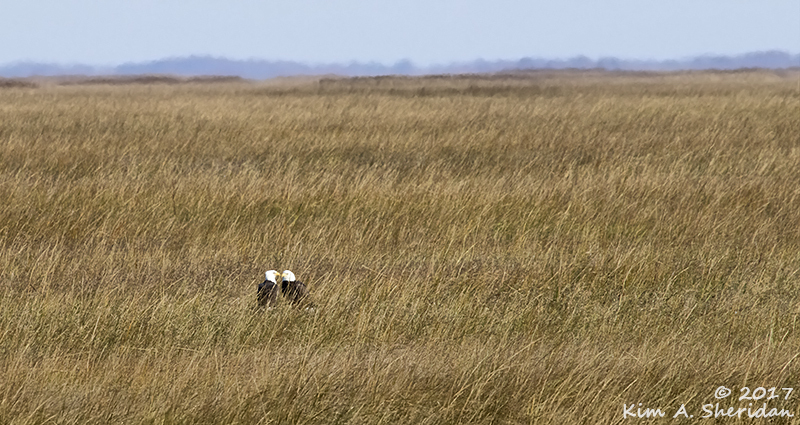 Robb, Don and I met Jeff and Erika at Bombay Hook NWR in Delaware on Thanksgiving morning for a little bird-watching. We were not disappointed. The Wild Turkey was Ben Franklin’s choice for the nation’s emblem. The Turkey lost out to the Bald Eagle. 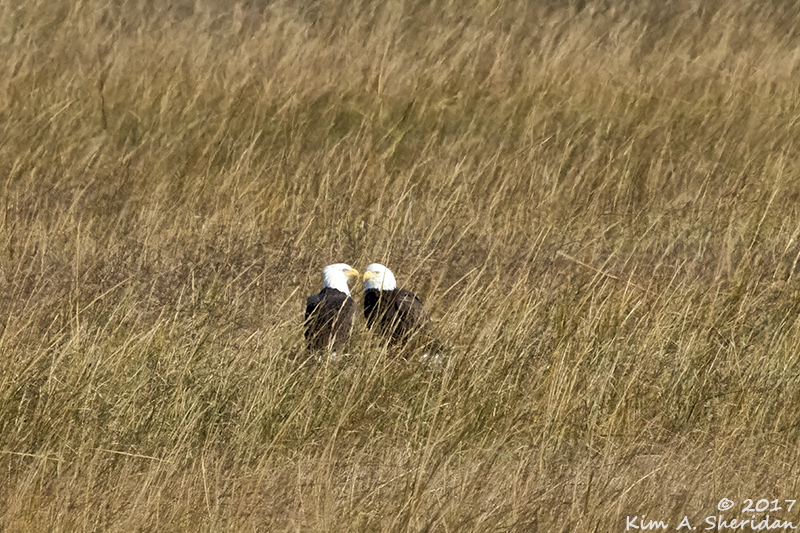 Maybe it was fitting that the first “Wow!” moment of our day was the sight of not one, but two Bald Eagles way out in the marsh grasses, nose-to-nose. 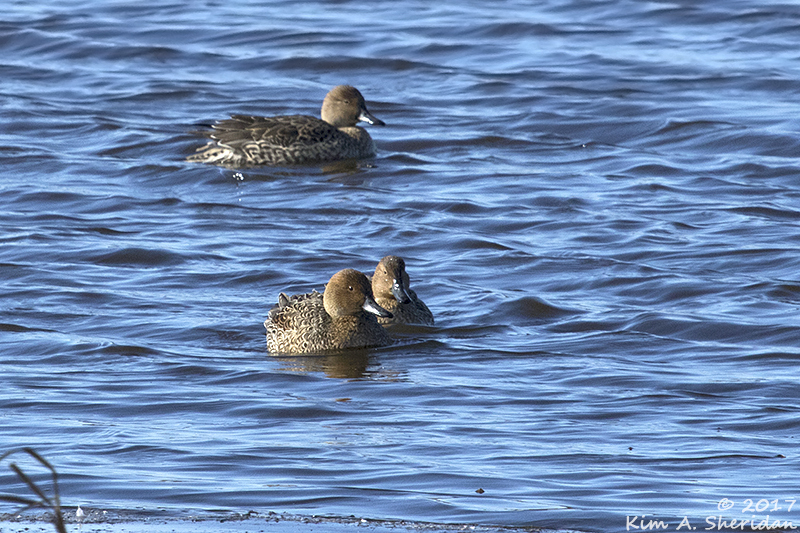 I was fixated on Pintails all weekend. Wood ducks and Harlequins are so colorful as to be almost gaudy, Northern Shovelers have those big, goofy bills, Green-winged Teal and Ruddy Ducks are just cute. 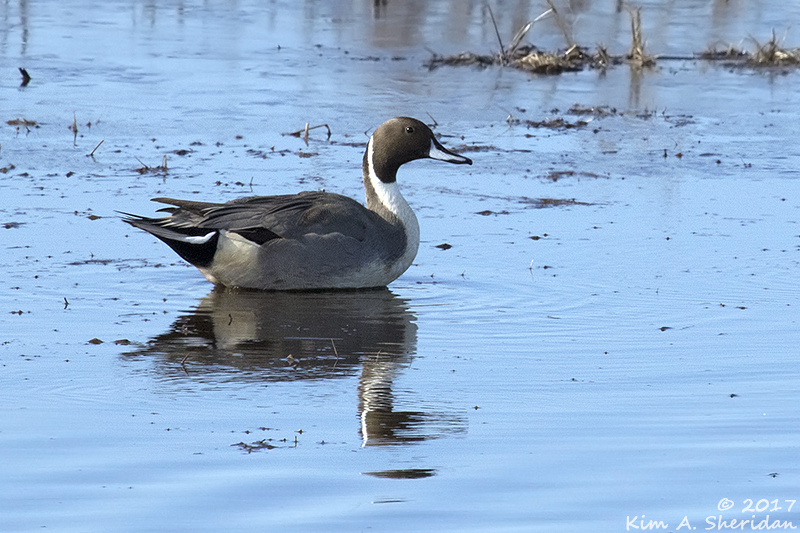 Northern Pintail drakes (males) are refined, classic, sophisticated. They are Dapper Ducks. You see things on a duck in flight that weren’t evident on the water. Like how the speculum (the rear edge of the wings) is barred with white, dark green, and just a little bit of burnt orange. 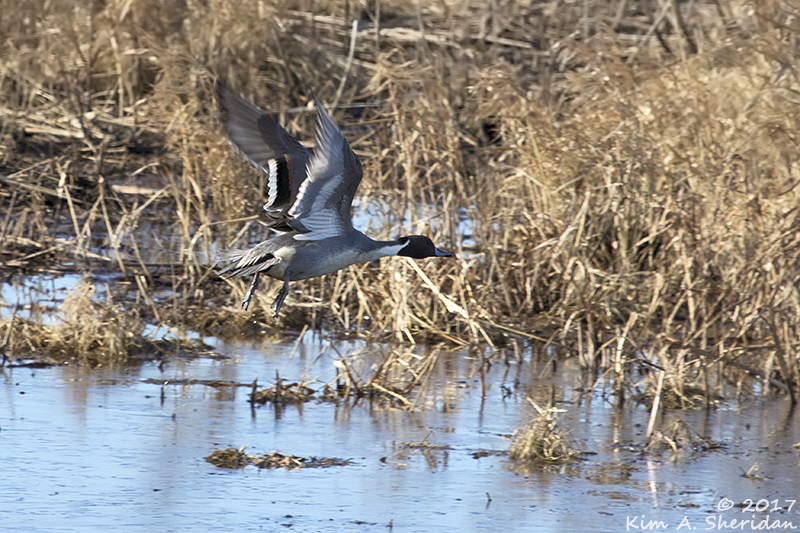 Pintail hens (females) are more muted but no less elegant, with their delicately patterned wing and body feathers. 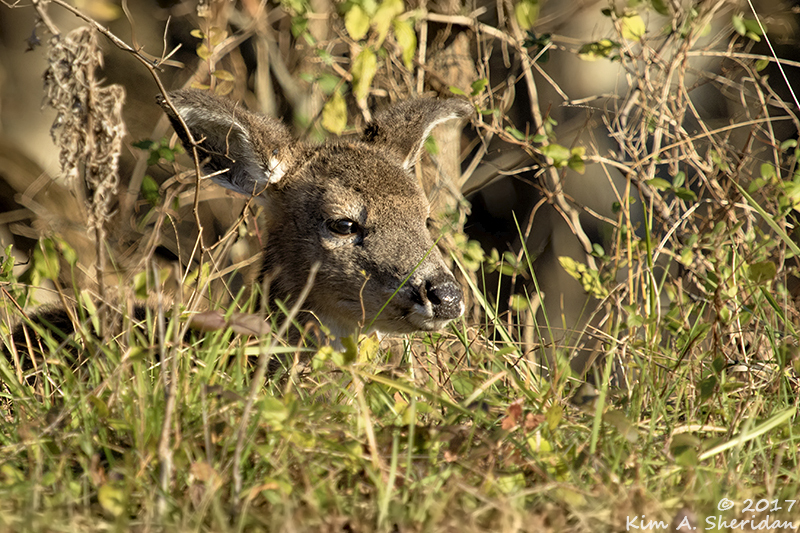 Robb spotted this small white-tailed deer bedded down at the wild edge between woods and meadow. Everyone who goes to Bombay Hook comes away with spectacular close-up photos of red foxes. Everyone, except for me. I’ve struck out more times than I care to admit. But I was assured that Jeff is the “Fox Whisperer”, and never fails to spot at least one. Sure enough, this is true. We were driving slowly along the road when a beautiful red fox ambles out from in front of Jeff’s car, crosses the road – and immediately disappears into the grasses. No photo, but I did SEE it. Ahhh, the wonder of flight. 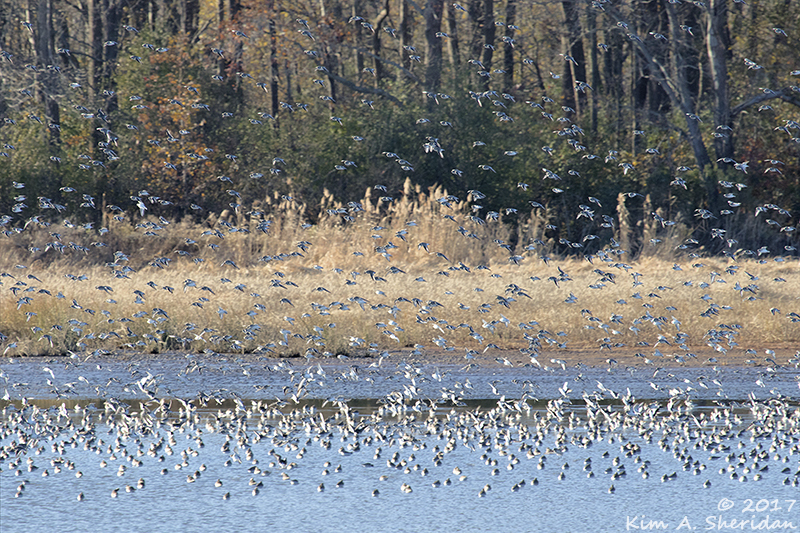 The day was filled with flying flocks of feathered friends. 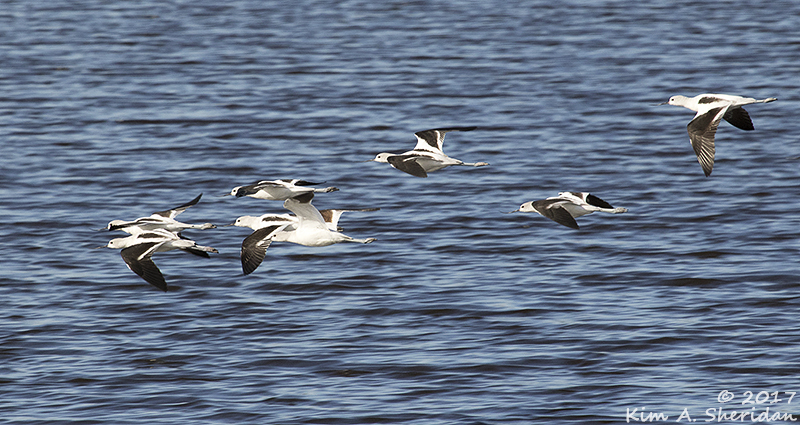 American Avocets. We took a little break from watching birds to eat them, indulging in a feast of roast turkey. Returning to Bombay Hook, we drove through a flock of thousands of Red-winged Blackbirds in the plowed fields on either side of the road. They took to the air in a whirling, swirling cloud that surrounded us on all sides with noise and wings. “We’re in the heart of the murmuration!” I exclaimed, awed. Er, what’s a “murmuration” please? It started as the collective noun for a flock of European Starlings, similar to a “murder” of crows or a “parliament” of owls. It’s come to mean the flocking behavior of starlings, hundreds or thousands of birds in flight, expanding and contracting, twisting and turning as one. Google “murmuration”, and watch the videos. It’s breath-taking. I was curious about whether the word could be applied as I was using it, to other species of birds. Yes, blackbirds do indeed murmurate. 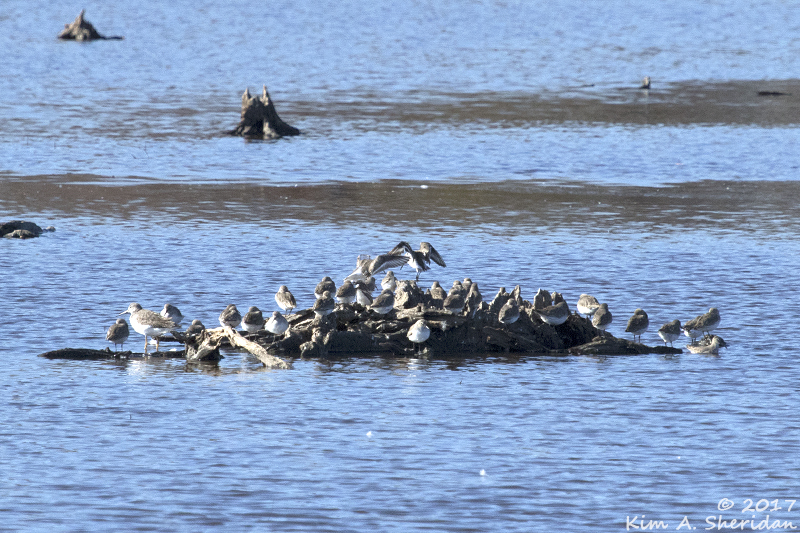 So do Dunlin, small shorebirds present in large numbers at Bombay Hook, wearing their drab winter plumage, and accompanied by a lone Yellowlegs. Not much to look at perched on a stump. But, oh, when they flew! My photos don’t do the sight justice. A small portion of the flock comes in to land. Why fly in the first place? And why move en masse? Here’s one answer – protection from predators. 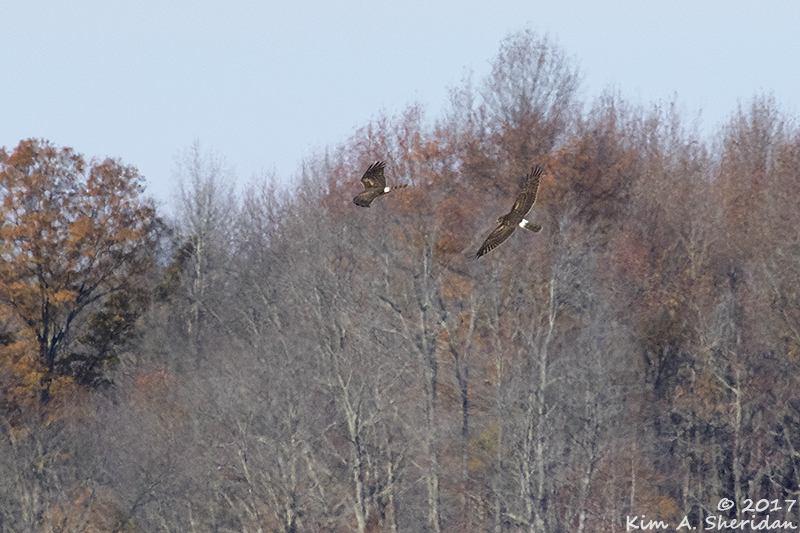 Two Northern Harriers were flying around. Harriers generally eat small land mammals like mice and voles. Perhaps the Dunlin didn’t get the memo. Here’s the bird of the day, a Barred Owl, out and about just before sunset. 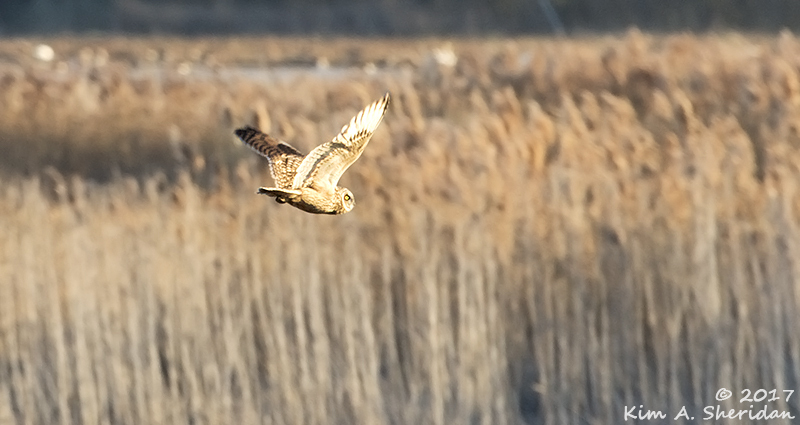 The Harrier nearby didn’t like it much, and gave chase for a moment. My only other encounter with a Barred Owl was four decades ago, at summer camp, as our nature counselor pointed out the call of a Barred Owl: “Whoo cooks for you? Whoo cooks for you? Whoo cooks for you-all?” Finally seeing one, actively hunting in the fading evening light, was a thrill. I am thankful for seeing this amazing owl, and for the lives of all our wild cousins. 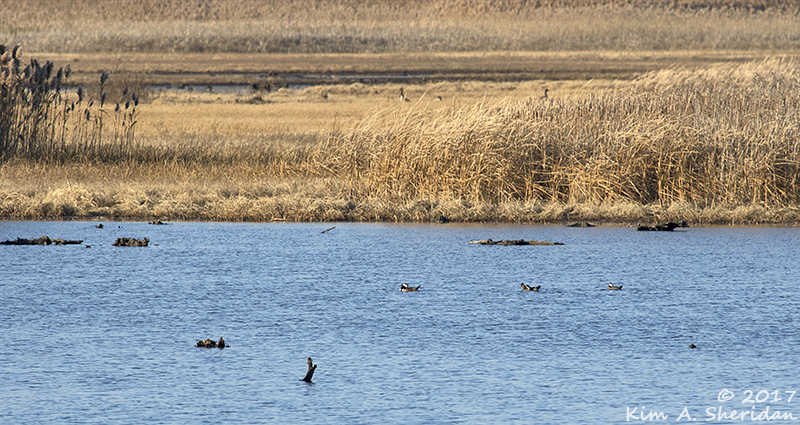 What better place to give thanks than at a National Wildlife Refuge? This entry was posted in Birds, Nature, Wildlife and tagged Birds, Bombay Hook NWR, Nature by Kim. Bookmark the permalink.